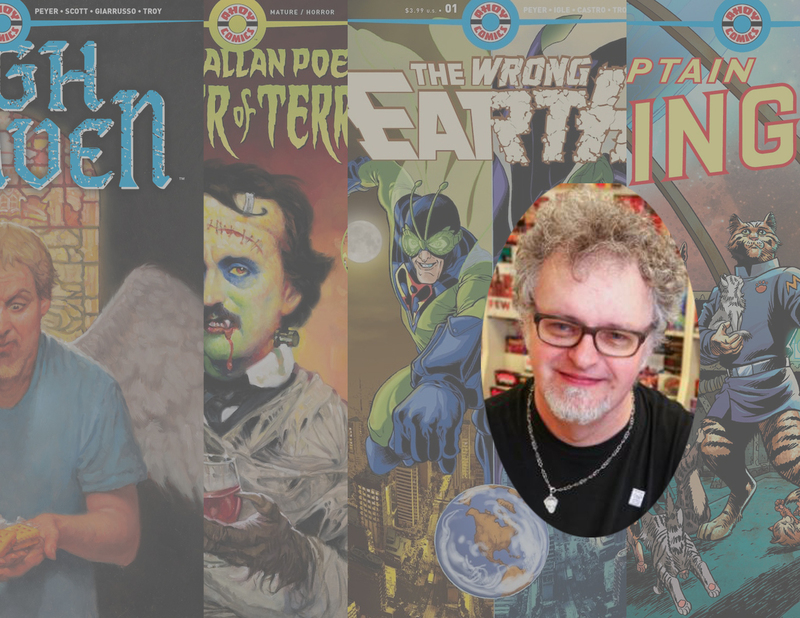 Talking the launch of AHOY Comics and 'The Wrong Earth' with comic book veteran Tom Peyer – AiPT! A new publisher is jumping into the scene with a lot of experience behind it. Tom Peyer is headlining AHOY Comics as a writer who has put in years in the industry, including as editor of Vertigo in the ’90s. His first book, in collaboration with artist Jamal Igle, tackles superheroes in a fun and gritty way. That book is out September 12th, which is why I just had to talk to him. Not only about this book, but about AHOY Comics and its entry into the comic book industry. AiPT! : Hi Tom, thank you for taking the time to answer a few questions. First off, I was able to read The Wrong Earth #1 and I really enjoyed it. Nice work! There’s a dual Earth situation going on with this title — what made you want to start your Ahoy Comics with a subject like this? Tom Peyer: Thanks for liking it! We thought about the launch more in terms of our first two comics, both coming out in September and soliciting together. High Heaven and The Wrong Earth are so different from each other, we felt they would demonstrate the wide range of material we’re after. They’re both fish-out-of-water stories, they both have really polished art, and they both have their moments of humor; but after that, they really charge very far off in their own directions. In October we’re launching Captain Ginger, in which writer Stuart Moore and artist June Brigman invent a whole new genre: feline space opera; and Edgar Allan Poe’s Snifter of Terror, in which we poke endless fun at a writer people revere. So none of these titles look or feel like each other at all. It’s like the opposite of a comics universe. We really value variety over conformity, and a good laugh over all. AiPT! : AHOY Comics launches this fall and I have to ask, with so many publishers in the field today why are you starting your own now? TP: That’s a good question, and I know you didn’t mean it this way, but it has to be said: our four monthly titles aren’t going to clog the market. I see a tendency to lay the problem of the crowded field at the feet of new publishers. But there are characters at the big companies who have twice as many titles as we do. If we were trying to do their kind of comics, I wouldn’t be hopeful. But that’s not what we’re trying to do. And I have to believe there’s room for different voices. AiPT! : What do you wish someone had told you about the comic business when you first started? TP: That I’d still be in it today. It would have prevented a lot of anxiety, I can tell you. AiPT! : As an editor of Vertigo in the late ’80s and early ’90s, is there anything you’re taking from that with your process in writing The Wrong Earth and your work building AHOY Comics? TP: Oh, everything. Everything. I was there with with the best writers and artists and editors as they worked on the most challenging material in all of mainstream comics. I learned all I know from sharing an office with Karen Berger and seeing how she dealt with freelancers and coworkers and story ideas and art; from working on scripts with Peter Milligan, Jamie Delano, and Grant Morrison; from planning covers with Brian Bolland, Simon Bisley, and so many others. The lessons you learn from people like that never get old. I think the Vertigo influence is closest to the surface in High Heaven. We probably could have published it then if only I’d thought of it. It’s about a self-pitying guy who dies prematurely and goes to heaven, and he really doesn’t like it there. In his defense, there isn’t much to like. But his fellow souls gang up on him anyway, because no one wants to spend eternity with a complainer. AiPT! : Going back to The Wrong Earth, there’s a clash between an older Golden Age style of comic hero and a more modern, Frank Miller style hero. What were your inspirations in creating these characters and the interesting dynamic in play? TP: I’m a Silver Age baby. Nearly every super-hero was an upstanding, virtuous champion of the status quo. A high-status friend to politicians and bankers. Spider-Man broke the mold, but the mold stuck around a while. And I have a lot of affection for those characters. They make me laugh, and I admire certain things about them, and certain things I don’t. Years later, the post-Wolverine hero–hostile, tired, and sad–slashed the mold to bloody ribbons. It was never to be seen again. There are things I admire about this newer hero, and certain things I don’t. The striking thing is that the same hero in the same costume could signify friendly authority to one generation and ruthless vengeance to another. It really interested me to put both versions in the same comic. We call them the gritty Dragonfly and the campy Dragonflyman. AiPT! : There’s a level of violence that can be shocking in this title. Are there any other adult themes you’ll be exploring? TP: Corruption, mainly. The authorities on campy Earth-Alpha are comically upright, while those on gritty Earth-Omega are inevitably crooked, violent, scheming and self-centered. Which comes as a real shock to Dragonflyman. He’s going to feel some feelings he never felt before, as will Dragonfly as he faces the incorruptible dullards of Earth-Alpha. AiPT! : What were your favorite comics growing up? TP: I loved everything. DC, Marvel, Creepy and Eerie, Mad, Herbie, The Spirit, Archie, T.H.U.N.D.E.R. Agents–there was good and bad work everywhere and I wanted to know it all. I couldn’t understand readers who were loyal to one company at the expense of everything else. Which is probably part of the reason AHOY is the way it is. But I don’t want to duck your question entirely. If I had to pick a sentimental favorite, it would have to be the first hero I got interested in, the Silver Age Superman. I love him to this day, and I know he could teach Dragonflyman a thing or two about being a dull, upstanding citizen.